← Wordless Wednesday: holy Darth Vader Batman! A year or so ago we tested a new beverage in our market called a refresher. Cut to July this year and Starbucks launched the new beverage in all their stores. I was in love and still am in love with the refresher. It’s a coffee drink using green coffee extract. For those that don’t know before you roast a coffee bean, it’s green in color. Starbucks use this coffee in its refreshers. 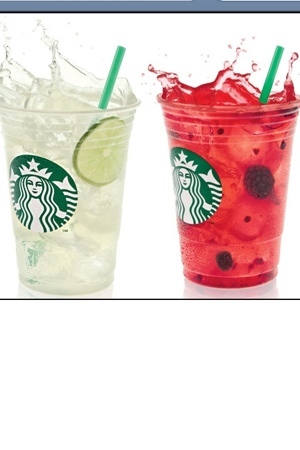 They offer two favors: cool lime and very berry hibiscus. Each one is a concentrate mixed with water and freeze dried fruit is added. Lime wedges in the cool lime and blackberries in the hibiscus. When they launched the drinks this year they also launched a via version for on the go. While I am a huge fan of VIA, I must admit I have been pretty skeptical about trying the refresher ViA. Since I’m on maternity leave I haven’t been in a store and I haven’t really been up to going in and trying some. The hubs came home and said he is sold out of VIA refreshers! Say what?!! Are they that good, I mean I would imagine the berry flavor would be pretty hard to replicate right? Well my mom is a huge refresher fan- even bigger than me! She buys a trenta berry refresher every morning and then refills it through out the day using the VIA. So I stole asked to try one of hers. I poured the packet into my water bottle and gave it a good shake. I decided to just go for it and took a big swig. Oh.my. Goodness!!!! So very delicious. It tastes just like the shaken version at the store. Starbucks I don’t know why I doubted you! I love that I can take my favorite drinks with me on the go!! We are going to the beach this weekend and guess what’s going in my bag? That’s right a little refresher VIA. I just hope they don’t run out anymore!!! This entry was posted in Coffee Talk and tagged coffee, starbucks, via. Bookmark the permalink.